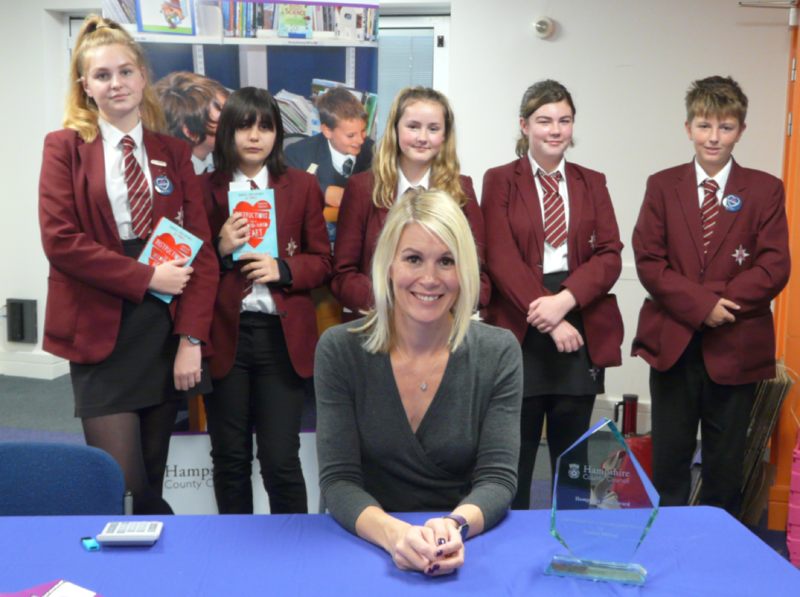 Students help name ‘Instructions for a Second-Hand Heart’ by Tamsyn Murray as the winner at this year’s Hampshire Book Awards 2018. The five Y9 students attended the Awards Ceremony on Tuesday 9th October in Winchester. Tamsyn proved an excellent speaker as she told her audience about how she first discovered a love of creative writing at secondary school. To her delight, her classmates enjoyed reading her stories. Not seeing this as a career path Tamsyn studied archaeology at university. Eventually, Tamsyn resolved to write a book and decided she wanted to write for children. She produced this first book in just six weeks, and it was published! Encouraged by this amazing start she continued to write more. Tamsyn explained that in contrast to her first book this award-winning book took her four years to write. She researched thoroughly. For example, she learnt about organ donation, hospital procedures and cancer in children. All this attention to detail certainly adds depth to the story. Tamsyn showed her audience one of the fourteen drafts she wrote before the book reached publication. It was a thick tome peppered with post-it instructions from her editor. Tamsyn finished with her top tip for success in creative writing: read, read and read! A question and answer session followed and we learnt that she attributed one of the major factors that made her who she is now to the fact that she lived near a local library as a child, which she constantly frequented. Tamsyn received her impressively heavy glass award from the Chief Executive of Hampshire County Council, John Coughlan. Students then waited their turn to talk to Tamsyn as she signed their books and for a group photograph. This was an inspiring and interesting talk from a well-spoken and charming author who hopefully inspired her audience in all things literary.